…naturally the best thing to do is to try to recreate recipes for breads you just bought in NYC, right? So my mother was willing to drive us (me, one of my daughters, and my sister who happened to be up in the area) up to Riverdale to see our grandmother briefly; then we had to grab lunch and dinner. We found a nice little upscale kosher grocery where we were able to get some fresh sushi, fish, salads, and a fresh loaf of seeded bread to go. As you may or may not know, right now I'm really on the verge of losing control. So naturally this afternoon when I heard that my daughter who has been bounced back and forth between inpatient and partial outpatient hospitalization was being re-admitted to an inpatient bread, my mind turned to baking chocolate chip muffins, and making up a bread recipe to produce a loaf similar to what we had on Sunday (which of course was finished by Monday evening). 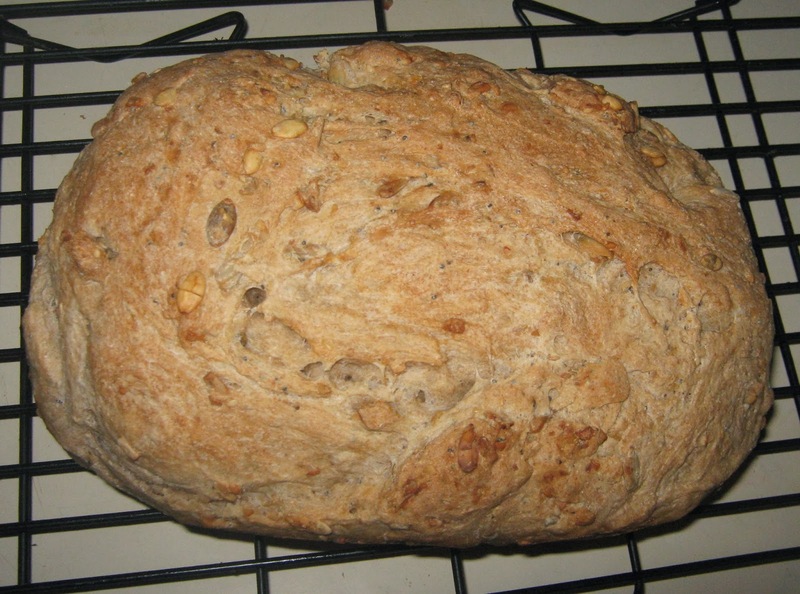 Put the water, salt, flour, and yeast in your bread machine on the quick dough cycle; add the seeds/nuts when the machine beeps or 5 minutes before the mixing is going to end if your machine doesn't give you a signal for that. Put the water, salt, flour, and yeast in your bread machine on the regular dough cycle; add the seeds/nuts when the machine beeps or 5 minutes before the mixing is going to end if your machine doesn't give you a signal for that. Use water between 115-120F. Put the water in your mixing bowl, add the yeast and let it sit about 5 minutes to dissolve. Add about half the flour, then mix in the salt, then the rest of the flour. This will be a pretty heavy dry dough compared to silky egg doughs, so it will take a good 10 minutes of heavy kneading, but it's worth it. Then put a little vegetable oil at the bottom of your mixing bowl, put the dough in and roll it around to coat it, flip the dough over so that the coated side is up and the bottom which didn't get oiled is oiled, cover the whole bowl with plastic wrap, a cutting board, or a dish towel, and let it rise about 75-90 minutes. Take your heavy but happy dough, and shape it into a loaf. You can put it in an oiled 9x5" loaf pan, on parchment paper on a baking sheet, or you can shape it into a baguette and put in a baguette loaf pan if you prefer. Let it rise, covered, for 45-50 minutes. Brush with warm or room temperature water just before baking for a crisper crust. Bake for 45 minutes for a regular loaf, 35 for a baguette.